The absence of John Mikel Obi in the Super Eagles friendly matches against Poland and Serbia due work permit issues, has provided Joel Obi an excellent opportunity to prove to Nigerians that he deserves to be in the team. Joel Obi arrived the Super Eagles’ Radisson Blu Hotel camp in Wroclaw on Monday and fully participated in Yesterday’s training session at the old Śląsk Wrocław stadium, Oporowska street, which lasted for just an hour. Joel Obi is in good condition with no injury worries contrary to earlier reports which suggested he might not be fit enough to feature for Nigeria in the upcoming friendly matches against The White and Reds of Poland and The Orlovi of Serbia. News emanating from the Super Eagles camp suggests that Gernot Rohr might actually give Joel Obi the nod to play the number 10 role in the absence of the highly influential Nigerian Captain John Mikel Obi. Although Alex Iwobi and Kelechi Iheanacho can equally play in that position, Joel Obi is favoured to step in for the absent John Obi Mikel. John Ogu, Ogenyi Onazi and Wilfred Ndidi who are other midfielders vying for starting berth in Friday’s friendly match against The White and Reds of Poland also participated in Tuesday’s light training session. There is no doubt that the absence of Mikel Obi will be felt both on and off the field but the team still has talents good enough to fill the void. As a way of motivating the team, John Mikel Obi is expected to speak with the players later on today (Wednesday). All 22 players currently in the Super Eagles camp are expected to train twice today at the same old Śląsk Wrocław stadium, Oporowska street. The two other goal keepers in the team, Enyimba goalkeeper Ikechukwu Ezenwa and South Africa-based Daniel Akpeyi are expected to arrive camp today. Las Palmas midfielder Oghenekaro Etebo is injured, and Al Ahly forward Junior Ajayi, who was unable to secure visa into Poland, and will fly directly to London for Tuesday’s clash with The Orlovi of Serbia at The Hive Stadium. 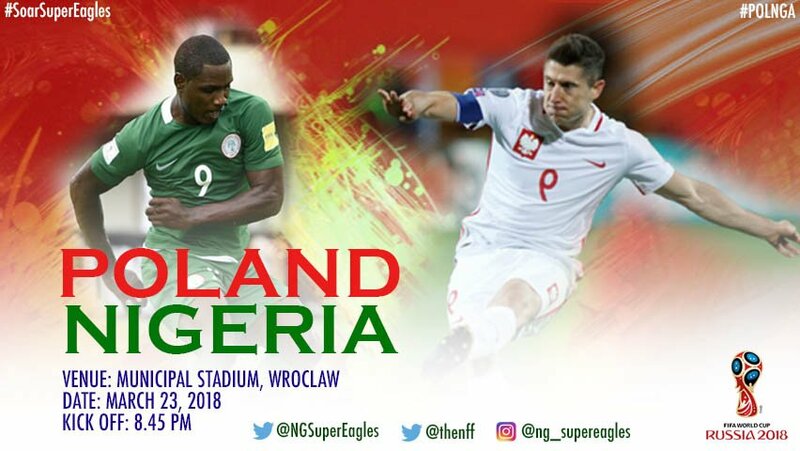 The friendly match against The White and Reds of Poland kicks off at 8.45pm Nigerian time on Friday inside the 43,000 capacity Municipal Stadium in Wroclaw, Poland. March 24, 2018 Obodo Charles Comments Off on Poland Vs Nigeria Player Rating: How Did The Super Eagles Players Perform?